SIOUX FALLS, S.D. 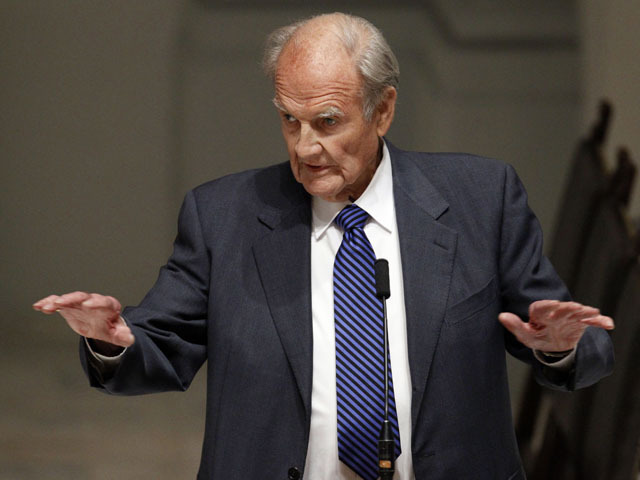 - Former Democratic presidential candidate George McGovern was alert, comfortable and in stable condition at a South Dakota hospital Saturday after hitting his head during a fall, hospital officials said. The 89-year-old former U.S. senator was taken by helicopter to a Sioux Falls hospital late Friday after falling outside Dakota Wesleyan University's McGovern Library in Mitchell. A school official said McGovern hit his head on the pavement about two hours before he was scheduled to appear on a live C-SPAN interview at the library. "Senator McGovern is alert and resting comfortably but, as with any head injury, it is important that we observe the situation closely," Dr. Michael Elliott, chief medical officer at Avera McKennan Hospital & University Health Center, said in a written statement Saturday. The statement said McGovern was in stable condition, though no other details were released. The hospital said his family was asking for privacy. The former South Dakota senator has lived in St. Augustine, Fla., since 2008 but also has a home in Mitchell. Friends and faculty who had gathered at the library for the C-SPAN taping said McGovern fell at about 5:15 p.m. Friday. McGovern was "bleeding profusely" but was conscious and talking as he was taken from the university by ambulance, said Donald Simmons, dean of the College of Public Service. McGovern's daughter, Ann, was with her father before he was taken to the Sioux Falls hospital. She said Friday that the injury was unrelated to her father's hospitalization in late October for exhaustion. University President Robert Duffett said McGovern had been excited to take part in the C-SPAN program "The Contenders," which focuses on failed presidential candidates who changed the landscape of American politics. McGovern lost his 1972 presidential bid against President Richard Nixon, who eventually resigned amid the Watergate scandal. Duffett said he had coffee with McGovern just hours before the fall and that McGovern was returning to the campus to grab dinner with faculty before the interview. McGovern was entering a side door when he "tripped and fell and hit his head hard," Duffett said. "It's just one of those things. He's made that walk many times before." McGovern has an office inside the library, which is named for him and his late wife, Eleanor. C-SPAN went ahead and aired the segment on McGovern, which included interviews with political experts and journalists and a discussion of his presidential campaign. During the segment, viewers were told McGovern had taken "a spill" and wasn't able to be on the program as planned, but that he was fine. McGovern was elected to his first of three terms in the Senate in 1962. Though he later lost the presidential race to Nixon, he continued to distinguish himself during his political career and was a lifelong advocate for U.S. and world food programs.